When quizzed about memorable food moments in Kerala, a state on India’s tropical southwestern coast, my instinctive response is pepper-banana chips with Babu. Babu Vattathara was our driver who, in the face of oncoming tuktuks, dictated personal recipes or tutored us in the Malayalam pronunciation of kozhy curry. He was our fixer for beer, the man with the selfie stick to hand and, after 10 days together, our friend. 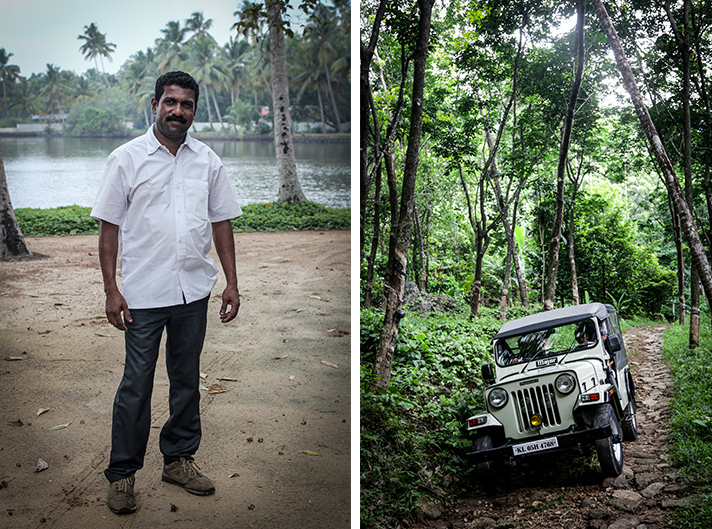 Babu Vattathara (left) exploring the jungle-like surrounds with Maju Balan in Vanilla County’s Mahindra jeep (right). 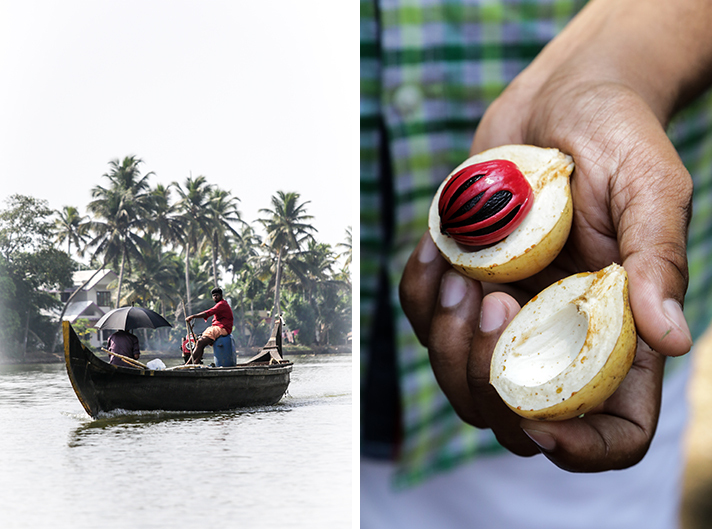 It was a vague mention of snacks that prompted his detour through Alleppey to Malabar Chips, where fresh bananas are fed through an electric slicer into a gigantic wok of boiling oil. They are left to swirl and bubble, tossed in the air and then whipped out, dusted with black pepper and offered around while still warm. We couldn’t get enough of them. Perhaps it was surprise and delight in the unexpected that enhanced their flavour. What’s for certain is these ‘crisps’ underscored the unselfconscious but undeniably nutritious local diet I was about to discover at a lineup of homestays. 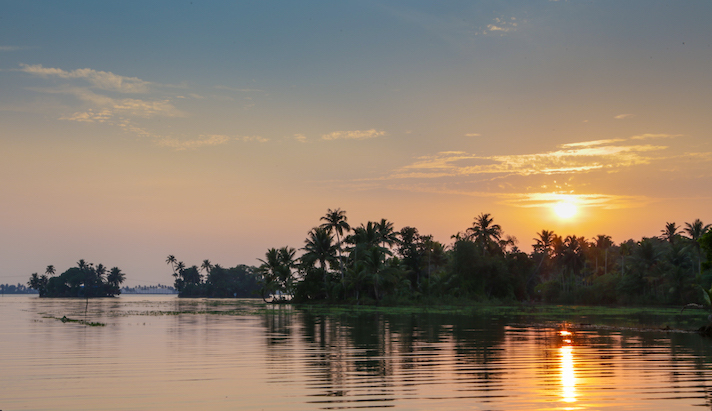 The first was in the backwaters of Kerala, a series of interconnected waterways where fresh water meets salt water from the Arabian Sea. Babu came to the end of a road and turned off the ignition. At a jetty a long-tail boat sporting white-painted cane chairs awaited. Steering the motor was Jomon Manichan, who didn’t say much but communicated by waggling his head from side to side with an occasional smile. Reluctantly we waved goodbye to Babu and puttered into the unknown until the watery ‘streets’ narrowed and the tropical vegetation closed in overhead. We passed women wearing house dresses standing knee-deep in water on steps leading up to their homes. They slapped washing on a stone – one woman cradled a gold iPhone7 to her ear as she did so. Others washed out the ubiquitous cheenachetty, a thickbottomed wok that speaks of the Chinese influence. Children splashed and giggled as they doggy-paddled around this domestic activity. People waved as we passed. The odd plastic bottle floated by. When we moored in front of Nelpura, our host Salimma was waiting. She led us over her stoep, which gleamed so bright I regretted having to step on it – even with bare feet, as is the custom – and welcomed us with a lunch that became a familiar hallmark of our homestays. Salimma and her husband Chackochan Edayady on the stoep of his ancestral home (top right). Egg ‘roast’ with spiced, sautéed onions, which Salimma served for breakfast (middle right). Jomon Manichan (above left). Anchoring the plate was unpolished Kerala rice, shorter and fatter than basmati, covered with dal. Arranged around it were always: a crispy component, like fried bitter gourd; a dry dish called thoran, tumbled with freshly grated coconut; a saucy vegetable sambar; a fried fish cutlet rubbed with ginger, garlic, lemon juice and stained red with chilli powder; poppadoms and chapatti, a South Indian flatbread. I still miss these lunch plates of varied vegetarian offerings and the substantial curry breakfasts of egg ‘roast’ or slowcooked brown chickpeas. Kerala is one of the few states where eating beef is legal but it’s by no means the starting point for a meal. Rather, rice, coconut and bananas form the foundation and everything is prepared fresh and from scratch. Most of what Salimma served during our stay came from her garden: the papaya, luscious mangoes and baby bananas at breakfast, and even her cooking oil is pressed from homegrown coconuts. Their last slaughter-sized duck of the season had been held back for our arrival so we could taste the coconut milk-based curry thengapal chertha tharavu, which is usually reserved for special occasions. Before dinner, we headed out for a cruise with Jomon. On emerging from the narrow canals into larger bodies of water, we mingled with waterbuses and houseboats, their wovenpalm coverings shaped like an armadillo’s armour shell. We watched the setting sun to the distant strains of a bamboo flute; it glowed fluorescent orange without radiating rays, like a bindi pasted onto a hazy sky. Later we watched Salimma cook while her husband, Chackochan, sang her praises, helped out and occasionally slipped his arm around her waist. We pleaded with them to join us at the table so we could keep chatting, and they obliged. 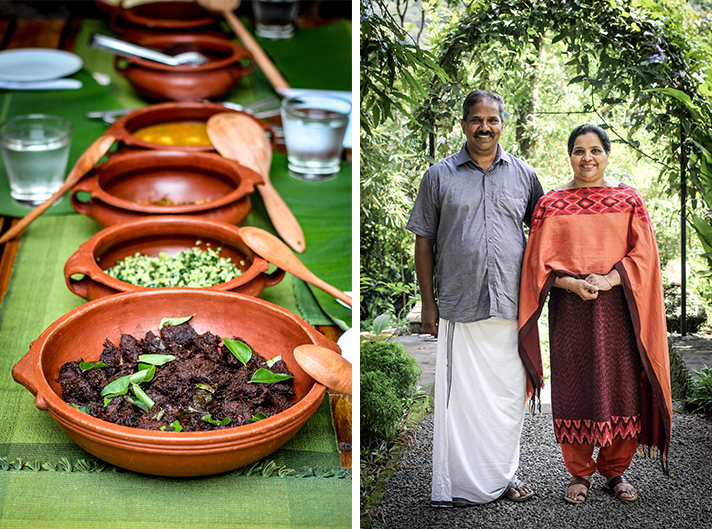 In Kerala a good host serves rather than sits with guests. Usually alcohol is BYO but here two Kingfisher beers were chilling in our fridge on arrival. 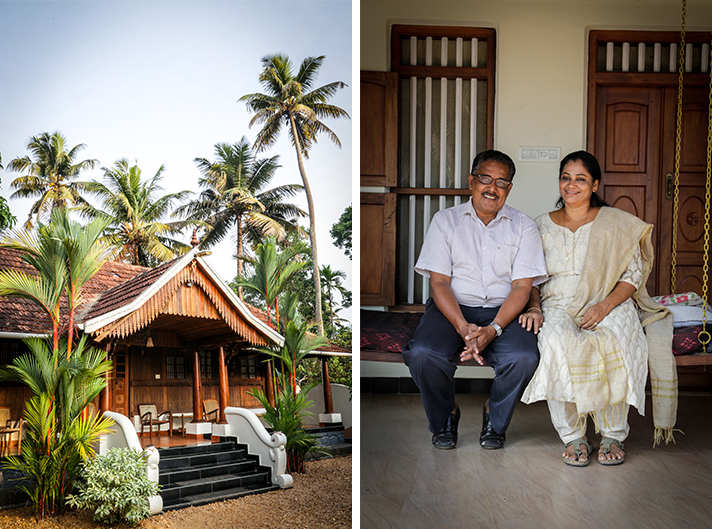 From the backwaters we headed for the rich biodiversity of the Western Ghats, to Vanilla County, owned by Mathew Vallipkappen and his wife Rani. Dusk fell as we followed winding single-lane roads through scrappy-looking towns and past hillside tea plantations where shade trees reached heavenward, until a brightly lit homestead emerged from the darkness. Lunch at Vanilla County (middle left), owned by Mathew Vallipkappen and his wife Rani (right). At Vanilla County we’d wait with great anticipation to be invited into the courtyard behind the wooden door (above left) to feast off bananaleaf plates. Rani’s uppumavu (above right), a breakfast staple of semolina flecked with chilli, ginger, mustard seed, curry leaf and cashew nut. We were shown to our rooms, spotlessly white through to the linen, by Mathew’s right-hand man, Maju Balan, who became our resident guide. We piled into a Mahindra jeep Babu Vattathara with him to visit a nearby rock pool and toured Rani’s spice garden, where he pointed out giant passion fruit, cashew fruit and one remaining vanilla creeper. At dawn we awoke to the exotic surround-sound, layered with the occasional bus tooting a musical horn as it passed somewhere high above and the ting-a-ling of the garden gate bell, all of it heightened by virtue of being so unfamiliar. The regular 6am solo I assumed must be Mathew, whistling as he walked to mass, but a beaming Maju informed me it’s the call of the malabar whistling thrush or, as they call it, ‘the naughty schoolboy’. 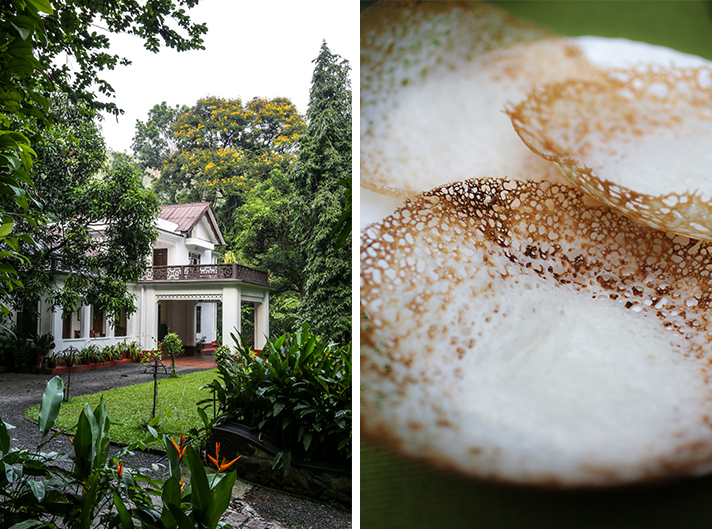 Besides that sound, one of my fondest memories of Vanilla County is a simple one: sitting on the red oxide stoep at tea time, sipping hot masala chai, snacking on jackfruit petals and battered fried bananas as sheets of rain fell and thunder broke overhead. Maju, Mathew and Rani wouldn’t blink at this scene because of its normalcy, but for me it felt so foreign and simultaneously so comforting because in that moment I was part of their family. Rani shared her homemade banana jam, fudgy jackfruit preserves and coffee from their plantation, and at lunch a line of clay pots ran down the centre ofthe table; these are now used for serving alone since being replaced in every home we visited by the pressure cooker. That said, much of the cooking is brisk, perfumed with curry leaves and popping mustard seeds. 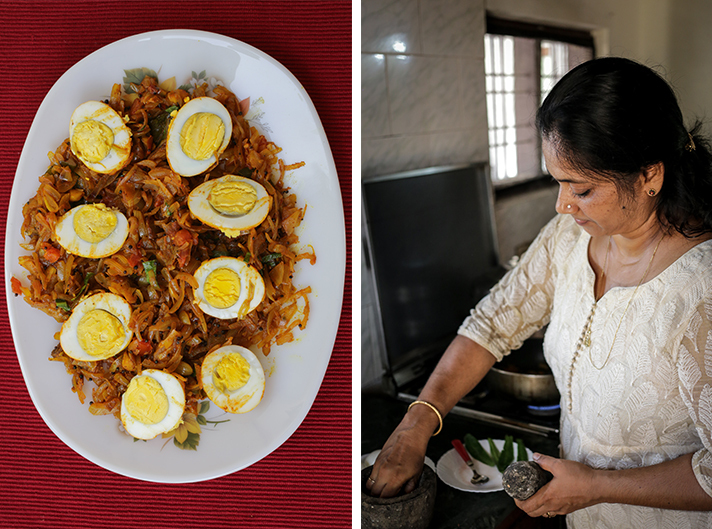 Except for a fairly recent fascination with masala dosa, the fermented rice crêpe filled with spiced potatoes eaten for breakfast, Kerala cuisine is seldom exported. Many of the ingredients I’d never seen before, like snake gourd and African coriander, which may explain why. Even the lemons look more like limes and the red onions separate out into cloves like garlic. Having visited a tiny area of this sprawling and diverse country, I will never again use the hopelessly inadequate term ‘Indian food’. But it’s the good grace we encountered thatstayed with me; clichéd as it may sound, I went for the food and fell in love with the people. Exploring India had always landed on the back-burner – until a casual conversation with Pippa de Bruyn, who spent a decade researching India for the Frommer’s guide and now curates outbound trips through her company, Best Kept. Aside from crafting itineraries matched to interests and budget, Pippa also works with local experts who arrange transfers, guides, drivers and assistance in the case of illness or lost luggage. A friend, Nic Dawes, who lived in Delhi during his three-year tenure at the Hindustan Times, shared generously on the subject of Indian cuisine. 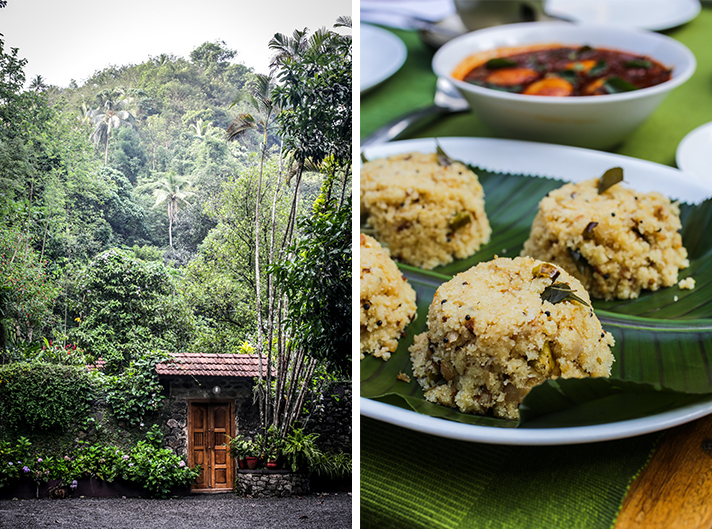 ‘If I had to pick an absolute favourite,’ he emailed, ‘it would probably be Kerala food.’ Pippa concurred, pointing out that for centuries this was the centre of the world spice trade. 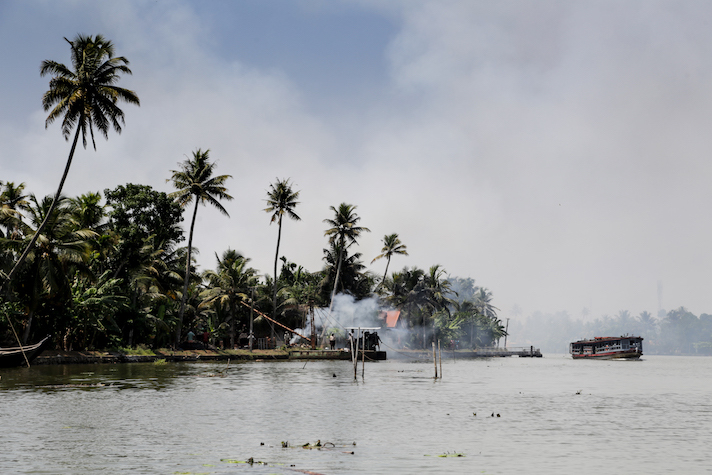 So the state of Kerala it was, and Pippa focused on a central thread of heritage homes and homestays. As the name suggests, accommodation is in a family’s home or on the property with all meals included, so the quality of cooking is important. Our rooms were in a separate annex, which allowed for increased privacy. And through this style of stay we were immersed, not only in the culture, but two vastly different landscapes. Having a driver and knowing we’d be met by a Best Kept representative at key points to ensure smooth transfers felt like true luxury. It meant we could maximise our time away rather than managing logistics. We were also issued a local phone loaded with all the relevant numbers on arrival, and our hosts and guides all spoke English. Published in the October 2017 issue of Getaway magazine.